Salad shirazi is a favorite Middle East salad prepared mainly with thinly chopped salad vegetables such as tomatoes, cabbage, carrots and potatoes. For this recipe, I have tweaked it with some radishes and some hard boiled eggs for garnishing. 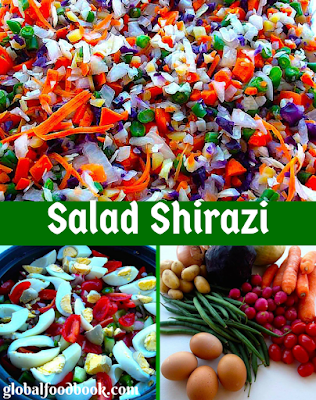 Although some Salad shirazi are mixed with herbs, spices, olive oil and lemon juice, I decided not to include these ingredients in this particular salad and believe me, this particular Salad shirazi still came out very nice with appetizing taste you can’t afford to miss.